of the Palestinian people are involved in terrorism"
"Fatah will not agree to any Palestinian being defined as a terrorist"
Today the UN General Assembly will be voting on a US-proposed resolution to condemn Hamas for firing rockets into Israel and inciting violence. The resolution demands that Hamas and other terrorist groups such as Islamic Jihad cease their "militant" activities, including the use of airborne incendiaries. Despite the rift between Hamas and Abbas' Fatah, Fatah has come to the defense of Hamas. - In fact it has come to the defense of all Palestinian terrorists! Fatah Central Committee member Abbas Zaki: "If Hamas, which is involved in resistance, is considered a terrorist movement, this means that all groups of the Palestinian people are involved in terrorism. This contradicts reality, as Hamas and the rest of the Palestinian factions are national liberation movements that are involved in resisting an Israeli occupation that is implementing terrorism against the members of our people... Hamas is part of us and we are part of it if a resolution is passed against it that defines its resistance as a crime. This is because Hamas - regardless of the internal and political differences of opinion - constitutes a state of resistance, whether we want it or not. It has a broad Palestinian presence, and we cannot abandon it to fight alone on the battlefield." Fatah Central Committee member Muhammad Shtayyeh: "Under no circumstances will we agree to any Palestinian organization being defined as a terrorist organization. We will not agree! Because today it is Hamas, tomorrow [Islamic] Jihad, two days from now Fatah... under no circumstances will we agree to Hamas being condemned." Al-Qawasmi: "Despite all of the differences of opinion with Hamas, and despite everything that it has done to harm the legal Palestinian government we know the order of priorities of the national activity well. We firmly oppose the American-Israeli attempts to denounce Hamas as terrorist at the UN, and we will fight to thwart the proposal." None of this is surprising as Palestinian Media Watch has documented over and over that Fatah is similar to Hamas in so many ways. Both movements promote violence and glorify terrorists. Both movements deny Israel's right to exist in any borders. Both movements see transfer of land to "the enemies" as "treason" and "a sin." And both mock Israelis fleeing rockets. 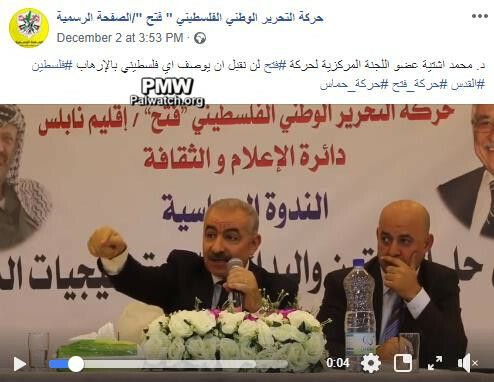 Posted text: "Fatah Movement Central Committee member [and Fatah Commissioner of Treasury and Economy] Muhammad Shtayyeh: Fatah will not agree to any Palestinian being defined as a terrorist. #Palestine #Jerusalem #The_Fatah_Movement #The_Hamas_Movement"
Fatah Central Committee member Muhammad Shtayyeh: "Now there is a proposed [resolution] at the UN condemning the Hamas Movement. From this podium we condemn this resolution, because under no circumstances will we agree to any Palestinian organization being defined as a terrorist organization. We will not agree! Because today it is Hamas, tomorrow [Islamic] Jihad, two days from now Fatah, and so on. We know the story. Our disagreement [with Hamas] is internal, but under no circumstances will we agree to Hamas being condemned." Headline: "Prominent senior Fatah official: Hamas is part of us and we are part of it, we will not abandon it to fight alone on the front line"
Hamas Political Bureau member Musa Abu Marzouq said in a tweet: 'The Fatah Movement's position regarding the American resolution proposal... is a responsible position, which expresses the national interest of an occupied people.'" Headline: "The UN General Assembly will vote Thursday on an American resolution proposal condemning Hamas - Al-Qawasmi: We oppose the denunciation of any Palestinian as a terrorist"
The American delegation to the UN said in a statement that it had hoped that the vote on the resolution proposal would be held on Monday, but the pressures exerted by the Palestinians succeeded in causing the vote's postponement to Thursday." 2007 Hamas takeover of the Gaza Strip - Mahmoud Abbas of Fatah won the 2005 Palestinian Authority Presidential election. However, Hamas won the 2006 parliamentary elections in both the Gaza Strip and West Bank, with a majority of 74 out of 132 seats, to Fatah's 45 seats. Fatah's rule of the PA Presidency and Hamas' rule of the PA government led to friction and eventually armed conflict between Hamas and Fatah. Hamas defeated Fatah militarily in the Gaza Strip in 2007, and since then Hamas rules in Gaza while the PA continues to rule the West Bank under Fatah.